MCM weekend was nothing short of incredible. The race is fantastic but the weekend events are just as much fun! 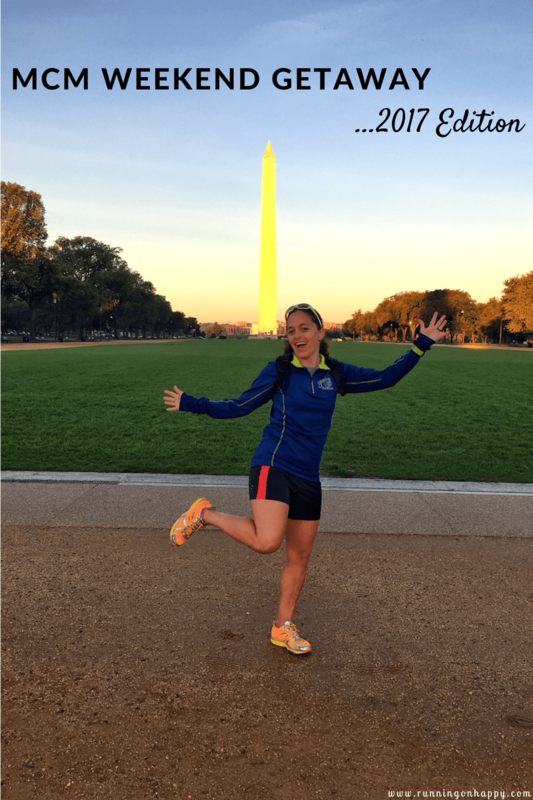 As suspected, Marine Corps Marathon weekend had me cycling through all the feels. I have so many amazing memories from the weekend. It’s been hard to sift through what you guys want to read vs. what I want to tell you. (Which is everything.) For the sanity of everyone, I’ll try to keep the important points in and the less important ones out. In any event, MCM weekend/race recap will be split into two parts. Today I’ll tell you all about MCM weekend leading up to race day. She believed she could — so she did. Kicking off the weekend the right way. With some girl power! On Thursday, Candice, Julie, and I loaded up the car and headed south. 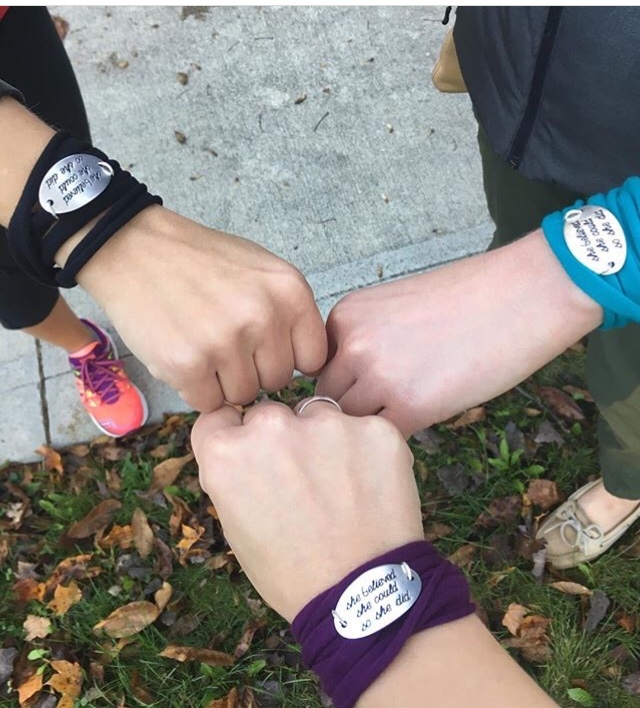 Before we started our trip, I wanted to give them a small token to commemorate our months of training together and to motivate us all across the finish line. We all wore our bracelets all weekend. It’s one of my new favorites! After about five and a half hours, we made a quick stop at my aunt’s house just outside of D.C. She filled our bellies with pastries from the deli and delicious fruit, and then we were on our way to our AirBnB in Columbia Heights. After we dropped off our stuff, we headed to Georgetown to meet up with some of my favorite bloggers — Courtenay, Erika, and Deborah — for dinner. I wish my time with them hadn’t been so short but I’m so glad we finally met in real life. It’s always so nice to put a voice to a name and face, and these three ladies were just as I imagined them from their online personas. Hopefully we’ll get to do it again next time I’m in the area! After dinner the three of us Clevelanders wandered around Georgetown. We ended up in a pretty awesome bar in a building that looked extremely familiar to me. I couldn’t pinpoint it but while we were waiting for our uber home I realized we were a few doors down from my brothers’s old offices on Wisconsin Ave. And I believe the bar we went to was an old bar my brothers used to frequent. It was such a trip! I snapped a few quick pics before our Uber arrived and we headed back for some sleep. The first night in the AirBnB was god awful. Since there were only two bedrooms, I offered to take one for the team and slept in the living room. BIG mistake. Our place was at the corner of a busy intersection, we were on the ground level, and there were no blackout shades on the front windows. The pullout bed was comfortable, but between the noise and the light, I couldn’t sleep a wink. We had made plans to go sightseeing on Friday but after Julie and Candice were up for the morning, I passed out in Julie’s bed for about two hours. I missed sightseeing but I really needed to rest. If I hadn’t been to D.C. before I would have been really bummed out. On Friday evening I met up with my college roommate, Alex, my friend Ben (from Cleveland), and Julie. 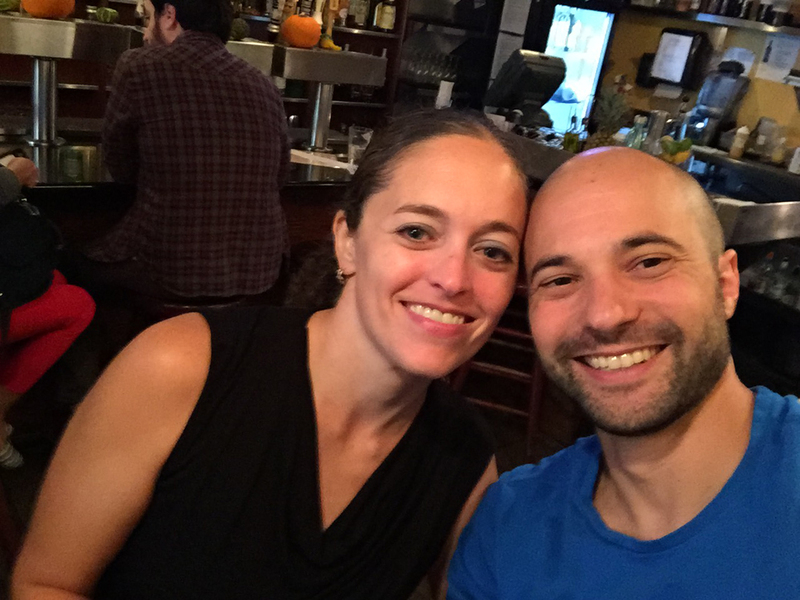 We met at a bar, had a beer, and then went out to dinner at Lauriol Plaza. There we ate delicious food and drank a delicious margarita swirl. Afterward we made our way to a gelato place, and we capped off the evening at a bookstore with a bar and restaurant inside. To say it was a fun evening would be a great understatement. It was so, so good to see my roomie again. We saw each other briefly three or four years ago (for like, 20 minutes) at a football game, but besides that we haven’t hung out together since 2003. He was one of my very best friends in Bloomington so it was really fun to spend time with him and catch up. 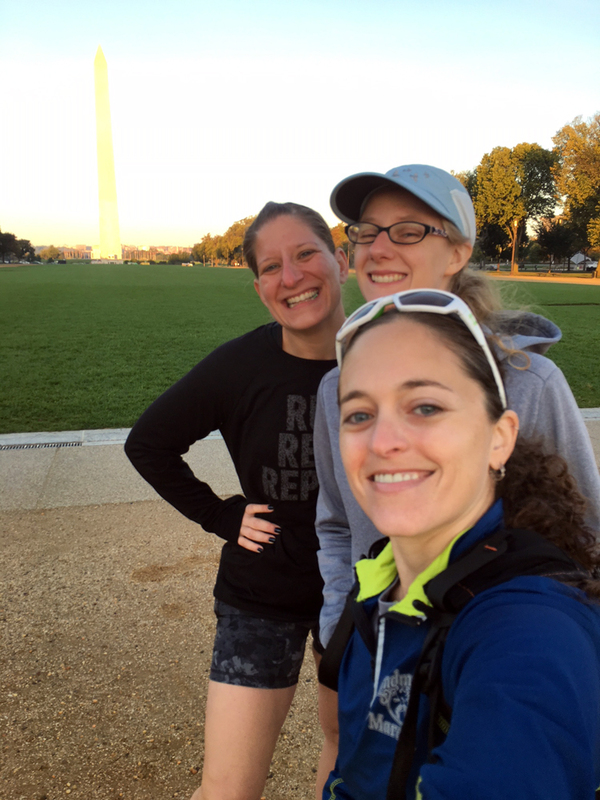 On Saturday, Julie, Candice, and I headed down to the National Mall for a shakeout run with an MCM Facebook group we’re in. We ran three nice and easy miles together while enjoying the sights and scenes of a quiet morning. Afterward, we headed to the expo where we promptly made our way to the Brooks area for all the MCM gear. We made our purchases and perused the rest of the expo before heading out to brunch with my family at Old Ebbitt Grill. The Old Ebbitt Grill is the oldest saloon in D.C. It has a very rich history and it’s a bit of a tourist spot for that very reason. Not to mention the food is delicious. A personal highlight of Old Ebbitt is that my uncle in-law’s office is at the top of the same building it occupies, and has rooftop access and views of the Mall, the White House, and the Eisenhower (formerly Old) Executive Office Building. It’s a gorgeous view to say the least. After brunch, I spent the afternoon with my aunt and uncle in-law and we got to catch up on family stuff and spend time together. They drove me back to my AirBnB and then it was time to start carb loading with the girls! We made pasta and watched Fuller House (which is actually quite funny if you haven’t seen it yet) and then we went to bed. And that, my friends is where I’ll leave you. MCM weekend was fantastic and this story is to be continued. Please come back on Friday for the Friday Five 2.0 where I will once again go rogue and give you my race recap instead. Have you been to D.C.? If so, what’s your favorite part of your time there? Have you stayed at an AirBnB? Did you enjoy it? Its too bad once again we weren’t able to meet up! Looks like such a fun weekend. Cant wait for the race recap! We’ll make it happen one of these days. Maybe we just need to sign up for a race together! 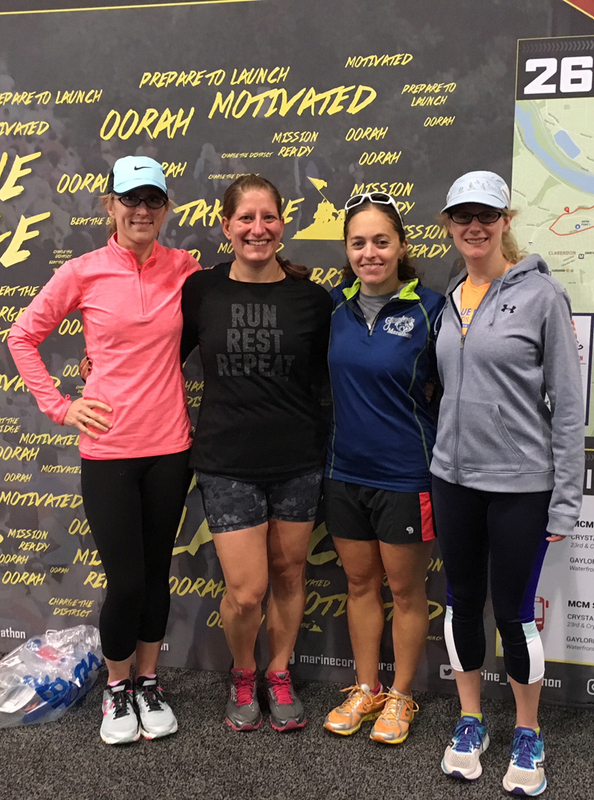 I think that’s the best part about destination races – meeting up with friends! Looks like a blast! It really is! I’m so happy I got to see everyone. Such fun. I wonder what it would be like for me to run MCM again. I kind of have it romanticized in my mind… I don’t know if I would want to tarnish it. But there is nothing like that run on the mall the day before! My recommendation for anyone running MCM is really just to enjoy it. I think if you choose to run it again you should go in without any goals, or expectations if you will 😉, and run for the experience of it. Then you can’t really tarnish your memory of it! And let me know when you decide to run — I’ll go then, too! Wow! Already sounds like a great weekend 🙂 Can’t wait to hear more! D.C. is just such a beautiful city, I haven’t been in a while though. DC is an amazing city! I love it there. It’s like a second home to me. You certainly had a busy weekend!! 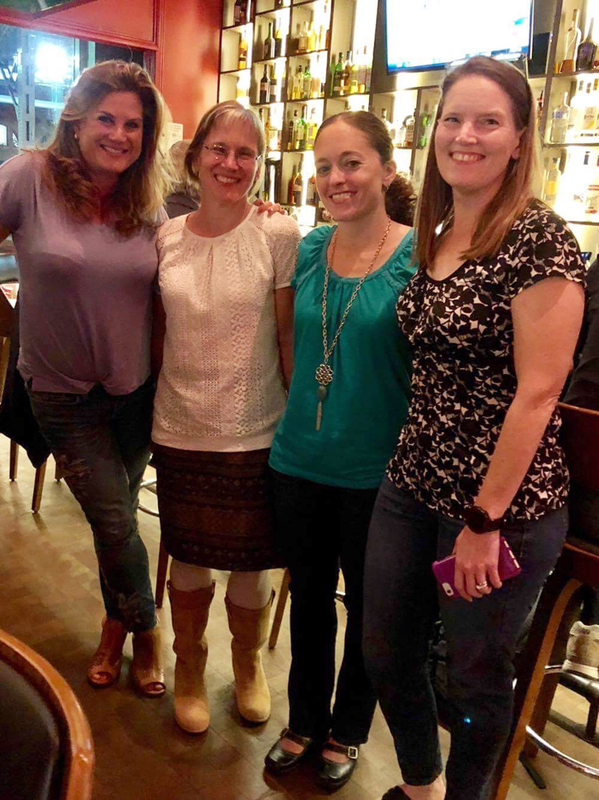 How great that you were able to meet up with Courtenay, Erika, and Deborah! It was such fun! I can’t wait for you to come to CLE so we can hang!! Nothing dumb at all! Such an amazing race and city! It was so great to meet you this weekend. Glad you guys had so much fun! 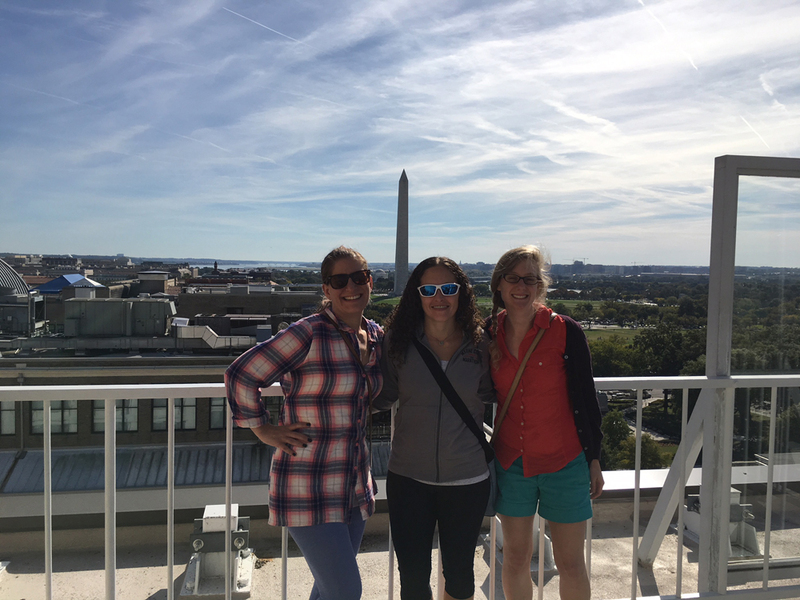 There is so much fun to do in DC! Bummer on the Air BnB but LOL on the familiar bar. I’m so glad we got to meet up.! Yes for sure! It was some Belgian beer house on Wisconsin. Can’t remember the name. But it used to be called Third Edition. I think I asked you about that actually. It was a cool place! Sounds like a ton of fun! How nice that you have so many relatives there. I have been to DC many times . . . but not since I got married, which is now 32 years ago. The closest we got was when I did ZOOMA Annapolis a few years back & we got caught in some godawful traffic on our way home. I lived in Laurel, MD for one year & loved going into DC! We’ve also stayed in Airbnbs a few times & so far, knock on wood, never had a bad experience. I love sight seeing, but the last couple times I was in DC was for conferences, and those don’t leave much time for exploring. I’d love to get to the American History Smithsonian to see as much as I could. That one and Air and Space Museum are fantastic. They’re all fantastic, actually. Can’t really go wrong with any of them! Looks like a great getaway! Loving the Momentum wraps for motivation. We took a family trip there and our favorite parts were walking to the White House and all the way through all the government buildings and of course the food!! We had a couple favs there Dolcezza for coffee, JRINK for our juice fixes, Founding Farmers for brunch, and Zaytinya for an amazing dinner. Oooh, those all sound delicious! I haven’t been to any of them. I’ll be sure to visit next time I’m in town! 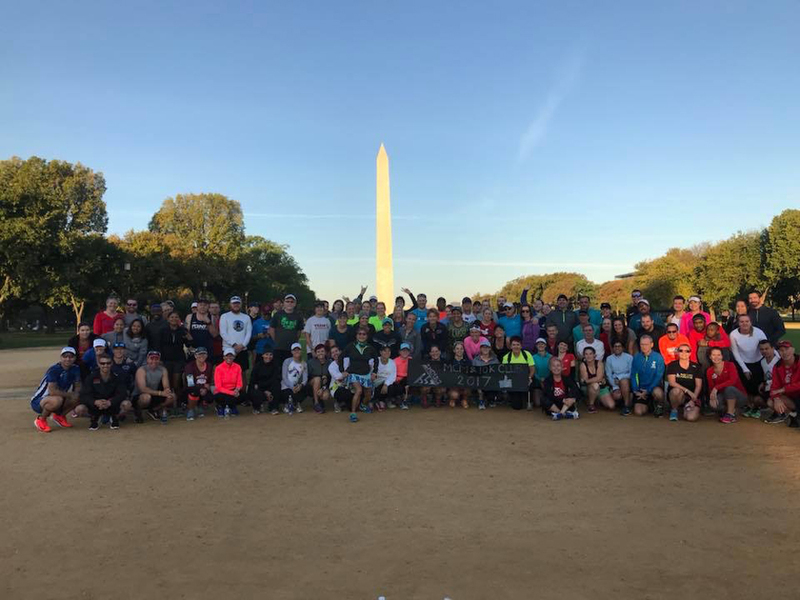 I’m bummed I missed the shakeout run… would have loved to miss some of the peeps from the facebook group too. Aw, it would have been great if you had been there! It was a lot of fun! Big group this year, too. Looks like such an amazing time! Glad you enjoyed it! I think it’s cool that you got to meet up with all the bloggers! I’ve been following along, so I know you had a great time. I’ve never been to DC, which is kind of sad if you think about it. We had a lot of fun. I wish I had more time with them! You need to get to DC!! I love DC. I think the Korean War memorial is my favorite landmark. Glad you had a good time! I have to agree with that. It’s one of the more jarring memorials. I love DC — it’s my favorite city ever. I’ve always wanted to head to DC! You should definitely go. There’s so much to do there! So many things to see and amazing restaurants. Looks like you had a fantastic time!! Great recap. I’ve been to DC many times on business but yes, being there for MCM weekend is the best. Sadly all my blogger meetups were cancelled the year I ran because everybody was evacuating before the hurricane. It’s a fun story to tell now if nothing else. Can’t wait to hear more! Bloomington??? Did you go to IU? I did not, but all my kids and all my money did! 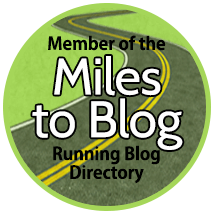 Can’t wait to read your recap of the race! I am looking forward to the full recap! Such a fun weekend and I love that you got to meet Deborah, Coco, and Erika!! This is so awesome! Congrats on the marathon! DC must have been a fun place to run. So many fun running meetups for you in DC. I did MCM many moons ago. Would love to go back. Can’t wait to read your race recap!